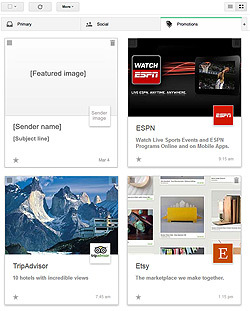 Google has made waves again in the email marketing world with the new “grid view” for the Gmail Promotions tab. This image-heavy layout will display thumbnail pictures for each message in a Pinterest-like framework. For email marketers, this can be a great opportunity to grab the recipient’s attention with a captivating image that previews the message contents. If you combine the image preview with a strong subject line, you have the ingredients for increased open rates and engagement. Gmail will automatically choose an image from the contents of the message, but you can designate a specific image to appear with your email by adding a small piece of code. Identifying the image is especially important if your message is text-heavy or if it includes smaller graphics. The required dimensions are at least 580 x 400 pixels, and it can be saved as a JPG or GIF. Gmail will resize larger images, but it is probably best to stick to these dimensions. Once you have the image designed and uploaded, just overwrite the blue text in the code below with your image URL and then copy all three lines into the HTML of your message. Additionally, grid view also includes a link and image for a Google+ page associated with the sender. This is part of Google’s on-going efforts to build engagement on their social network. If your business has a Google+ profile, this can be a valuable tool for cross-channel marketing. If you don’t use Google+ for your business, you might want to consider establishing a presence. You can read how to setup the Gmail/Google+ connection here. Finally, Gmail has provided some details on optimal sender and subject lengths. They recommend keeping the sender name under 20 characters and using a subject line that is no longer than 75 characters. Staying within these limits will ensure your email is viewed correctly within the new layout. What do you think of grid view? Do you think other email services like Yahoo or Outlook will follow Gmail’s lead and add a visual-driven inbox setting?